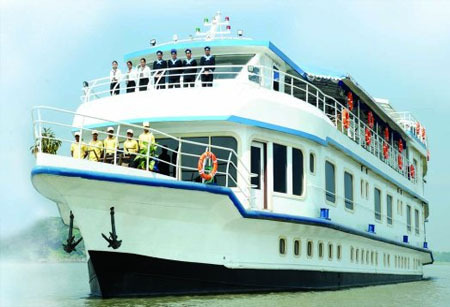 ABN Charaidew II has 18 cabins in total: 2 spacious deluxe cabins (350 sq. feet) and 12 spacious twin/double cabins (240 sq. feet.) are on the upper deck while 4 cabins with queen size bed (170 sq. feet) are on the main deck for which we charge no supplement.The decor reflects a sense of homecoming to Assam, with touches of colonial elegance, brought to life by traditional Assamese designs on hand-woven cotton fabrics.